Water, mountains, and peninsulas. That's all there is to the geography of ancient Greece, right? Well, those are a big part of Greece's physical geography, but they don't tell the whole story. How did ancient Greece's geography affect culture? How did the ancient Greeks adapt to their geography? How did they alter it? Where the heck is Greece, anyway? In order to get a bigger picture of the geography of ancient Greece, let's try using the 5 Themes of Geography. Let's go through each theme and come up with some examples. Keep in mind, there are practically unlimited examples you could come up with, but to keep this short, let's limit ourselves to 2-6 examples per theme. Location -- Where was ancient Greece? Ancient Greece was on islands and peninsulas in the northern Mediterranean Sea. The center point of the modern country of Greece is 39 degrees North, 22 degrees East according to the CIA World Factbook. Place -- What were the physical and human characteristics of ancient Greece? What made it unique? Ancient Greece's had lots of mountains, water, and islands. Ancient Greece had a temperate climate (think Goldilocks - it's just right) with mild wet winters and warm dry summers. The ancient Greeks were polytheistic. They worshiped many gods. They built city-states. Those Greeks who didn't live in the city-states lived in the surrounding farms and villages. The ancient Greeks are often credited with inventing democracy. The ancient Greeks were influenced by an earlier culture on the island of Crete called the Minoans. The Minoans are famous for their frescoes. Frescoes are paintings done on wet plaster. 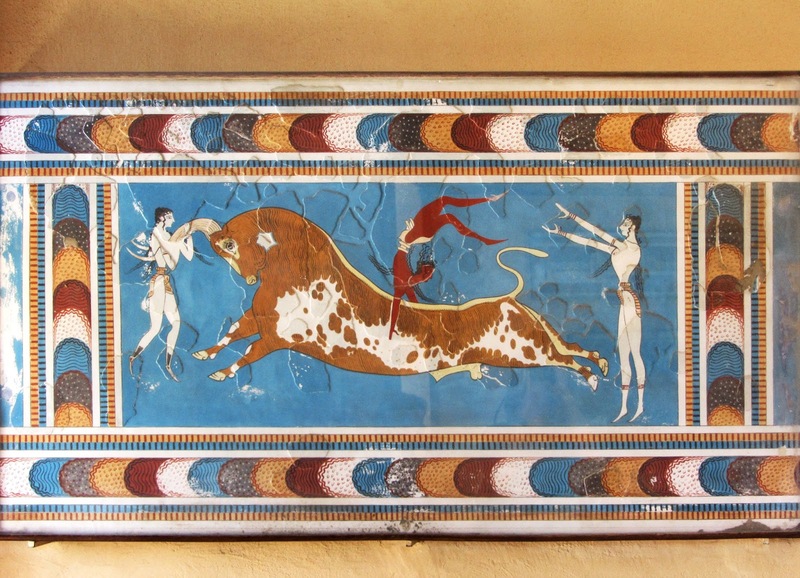 The fresco shown above shows an interesting pastime of the Minoans, bull-leaping. Human / Environment Interaction - How did the ancient Greeks adapt or alter their environment? How did their environment affect how they live? Many Greeks lived near the sea so they relied on the sea for food and a way to travel and trade. As a result, many Greeks became excellent sailors and seamen. Most land was not great for farming, but olive trees grew well in Greece, and goats were adapted well to the rocky, mountainous land. Olives, and especially olive oil, became a product the Greeks used and traded a lot. They were able to add more protein to their diet from goat meat and goat's milk. 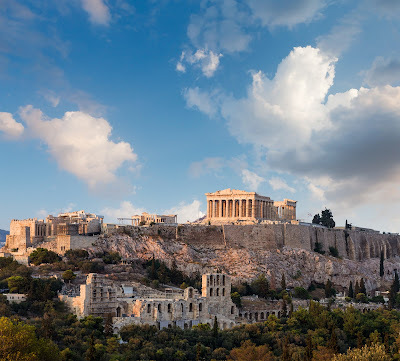 Early Greek city-states were built on hills for protection (the acropolis, or high city.) As the city-states grew beyond the hill, the acropolis became a place for temples and other important public buildings. These buildings were often built using stone quarried from nearby hills and mountains - example: the Parthenon. At the battles of Marathon, Thermopylae and Salamis, the Greeks used their environment to their advantage in fighting the Persian Empire. The Greeks were under constant threat of earthquake. Some of their myths, legends, and stories deal with these and other natural disasters. Early Greek city-states were isolated from each other by mountains and the sea. This made travel and trade more difficult. City-states became fiercely independent, had their own traditions, and sometimes became rivals partly because of their isolation by geography. Acropolis ("high city") of Athens upon which many temples and monuments were built. The big one is the Parthenon, a temple to Athena the goddess of wisdom and war. Most Greek city-states had an acropolis. Movement -- How did the ancient Greeks move people, ideas, and goods? What patterns of trade and migration did they have? Most Greeks traveled by sea or by foot. The rocky and mountainous terrain made travel by wagon or other wheeled vehicles difficult. Trade was done the same way, by sea and by foot. Ideas spread the same way. Sailors and traders spread news as they traveled to different ports and cities throughout Greece and the region. Runners were sometimes used to get specific messages from one place to another. The Greeks had a written language. The ancient Greeks traded with people throughout the Mediterranean. 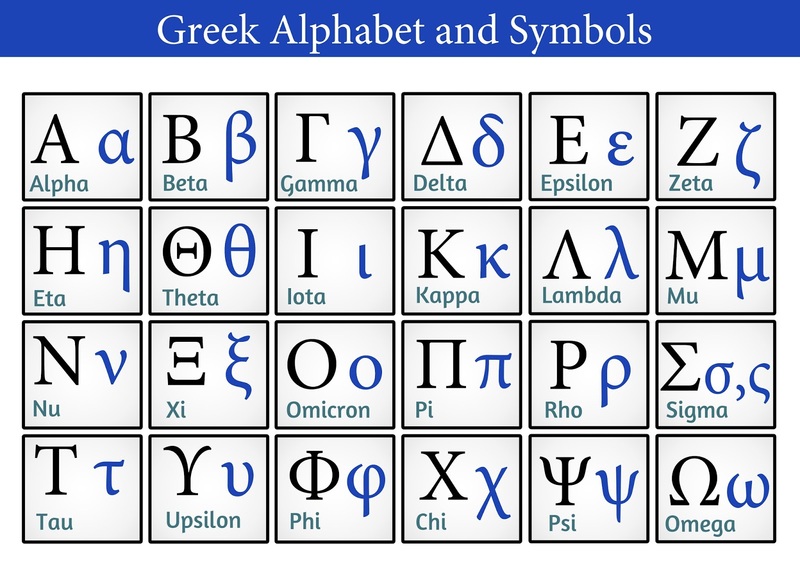 Letters of the Greek alphabet. 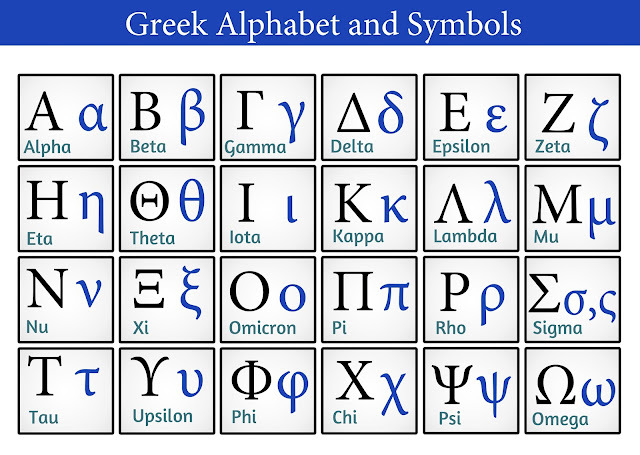 The Greeks developed their alphabet from the Phoenician alphabet. The Greeks came into contact with the Phoenicians through sea trade. Regions - What areas of ancient Greece have similar characteristics? 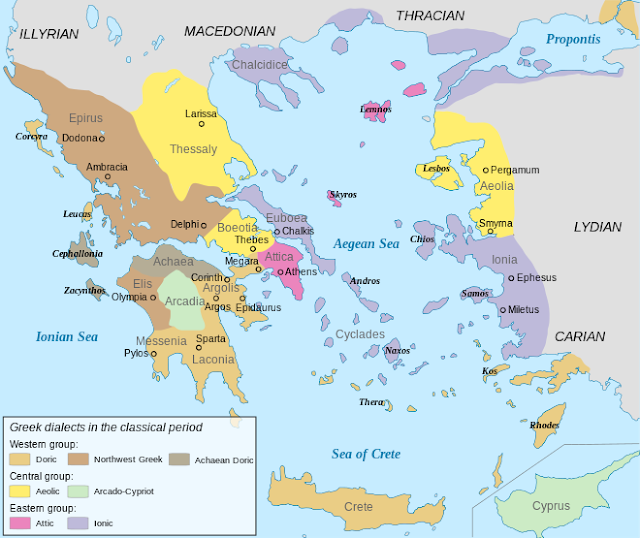 How are areas of ancient Greece grouped together? A region of Greece based on physical geography is the Peloponnesus. The Peloponnesus is the large peninsula that sort of "hangs" off of the main peninsula. It connects to the main part of Greece by way of the Isthmus of Corinth. Sparta was a dominate city-state on the Peloponnesus. There are a many ways you could go from here. You can add examples to those that I've written about here. You could pick a city-state from ancient Greece like Athens, Sparta, Corinth, etc. and analyze it based on the 5 Themes of Geography. You could pick a Greek myth and analyze the geography of it using the 5 Themes. You could pick an event from ancient Greek history like the Persian Wars, the Peloponnesian War, the trial of Socrates, etc. and analyze the geography of that event using the 5 Themes. Make a region map using a creative material like beads or rocks. Use pasta! Invent your own city-state and place it on the map (or better yet create a new Greek island in the Aegean.) Then analyze your made-up city-state using the 5 Themes. Write a play! A Greek tragedy or comedy! The possibilities are endless! Be creative! I hope this article was helpful. If it was, please share it with someone because that's how the word gets out!